I get so inspired looking at all these sewing and crafty blogs at my desk all day, sneaking peaks between phone calls. I figure I better start to share the hurried creations I make after work and on the weekends. 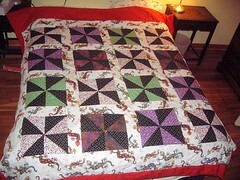 I started this quilt with the pinwheel squares and didn’t really love it. When I found the lizard fabric deep in my fabric stash I knew it would draw it together a little better. I still don’t love the quilt on the whole but I keep looking back the picture and liking it more. The happy couple sent the nicest thank you note, how nice of them to lie. I am sure it clashes with everything. next time, 4 patterns of one color and no crazy rainbows.